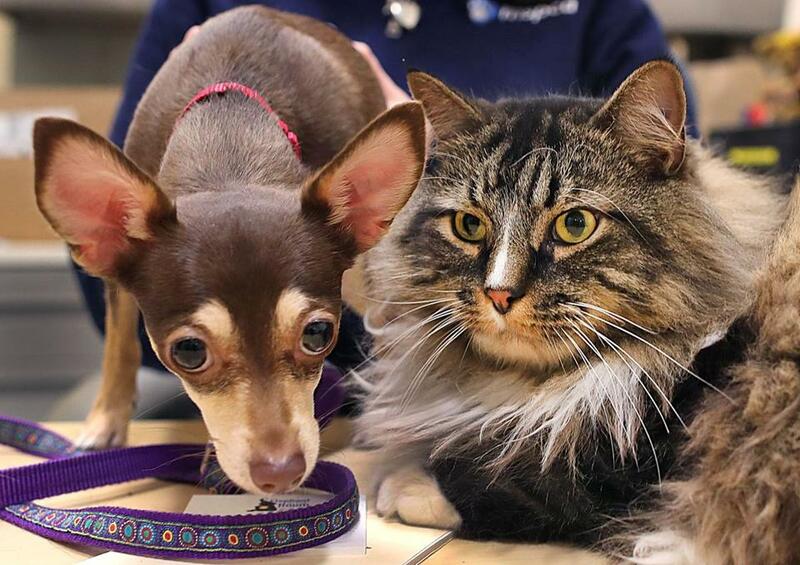 Kitty, a long-haired tabby cat and Leila, a Chihuahua are staying together at the MSPCA, waiting for a new owners to adopt them together. The Massachusetts Society for the Prevention of Cruelty to Animals has broken some of its own housing rules to accommodate an inseparable cat and dog surrendered together last week, the organization said. 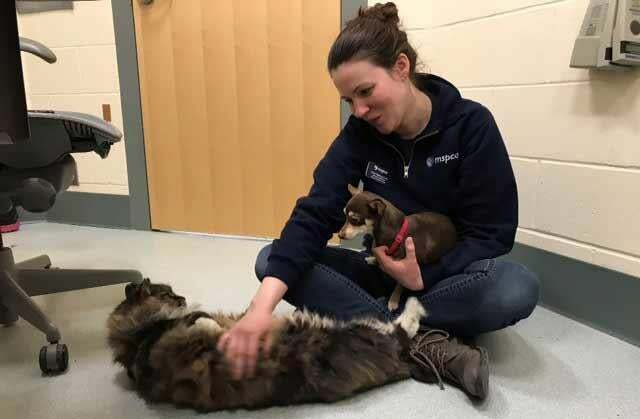 Kitty, a long-haired brown-and-white tabby, and Leila, a Chihuahua, were given to the MSPCA in Jamaica Plain together on March 14 after their family’s new home could not accommodate the animals, the MSPCA said in a statement. “Neither pet wants to eat without the other present. Kitty will yell loudly if Leila is taken away. So staffers broke with traditional housing protocol and are now housing the two friends together in the same room, the better to deal with the stress of losing the only home they’ve ever known,” the statement said. Being forced to move to a new home that doesn’t accommodate pets is the primary reason animals are surrendered, said Anna Rafferty-Fore, MSPCA associate director. Leila, 2, has lived with Kitty, 6, since her birth. The MSPCA is now searching for somebody that will house the two together. “They are playful, affectionate, and gentle — all the qualities that make for wonderful pets,” Rafferty-Fore said. Anna Rafferty-Fore played with Kitty while holding Leila.